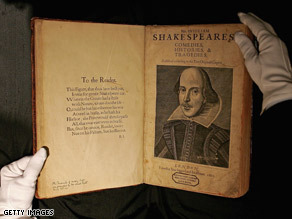 Chicago mayor urges citizens to "screw their courage to the sticking place"
Theater group promotes more use of "methinks," "prithee," "fie," and "in sooth"
(CNN) -- Hast thou been patterning thy parlance to evoke the vernacular of William Shakespeare? William Shakespeare is being honored in Chicago and on the Web on the 445th anniversary of his birth. Well, get thee to an Internet machine hastily, sirrah or mistress, for thou hast but two days from Tuesday to unleash thy inner bard. Mayor Richard M. Daley of Chicago, Illinois, has declared Thursday as "Talk Like Shakespeare Day" to celebrate the 445th birthday of the man many consider the greatest playwright in the English language. While the bard's actual birth date is not known for sure, many scholars think it was April 23, 1564. In a proclamation issued last week, Daley encouraged city residents to "screw their courage to the sticking place and celebrate Shakespeare by vocal acclamation of his words." There's no reason why the rest of the country cannot play along, peppering our conversation with -- as the mayor suggested -- phrases such as "prithee" and "fie!" or, if you're at work, "pass yonder stapler." It isn't as difficult as it sounds. After all, Shakespeare single-handedly contributed more than 1,700 words and phrases to the English language -- everything from "foul play" to "monumental" to, of course, "all's well that ends well." Talk Like Shakespeare: Unleash your inner Bard! But should you need some help, head over to talklikeshakespeare.org -- a Web site that the Chicago Shakespeare Theater unveiled Monday. Here, visitors can share their "Shakespeariences" -- their first memory of Shakespeare or their favorite quotes; subscribe to a Twitter feed where the Bard of Avon will generously translate your 21st-century English into its 16th-century equivalent; or listen to the Q Brothers singing about the finer points of speaking Shakespearean. Did we mention it's a rap song? Don't waste time saying "it." Just use the letter "t" ('tis, 'twill, I'll do't). To add weight to your opinions, try starting them with "methinks," "mayhaps," "in sooth" or "wherefore." Finally, if you're inclined to yell at the driver who cuts you off as you head to work, why settle for "idiot," when "thou rank white-livered canker-blossom" is so much more satisfying. For more ammunition, you can consult the random Shakespearean insult generator on the British site william-shakespeare.org.uk. "Thou vain fly-bitten moldwarp!" and "Thou gorbellied clapper-clawed scurvy-knave!" are just a sample of the offerings.